If I was not quite the only Yes fan who viewed the grafting of two Buggles onto the band as something with potential, then certainly I was in a very small minority. For although Yes had been my band for much of the 1970s, and who generally could do no wrong, even my almost devout admiration had been shaken by the crappy Tormato album – on which, the band’s attempted riposte to punk rock, Release, Release still curls my toes in embarrassment each time I hear it. Additionally I had heard the Buggles’ Age of Plastic album, and considered it to be an enjoyable collection which did not take itself too seriously. The big hit Video Killed the Radio Star, I didn’t care too much for, but stronger pieces like Clean, Clean, Johnny On the Monorail, Elstree and Kid Dynamo were all fun stuff. So I felt a transfusion of fresh blood with pop sensibilities seemed perhaps to be just what Yes required. 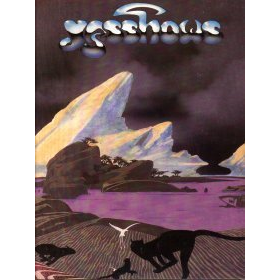 The resulting album Drama, slightly disappointingly, fell between two stools really, due to Chris Squire pushing the band to remain as Yes-ish (if that is a word) as possible, with new lads Geoff Downes and Trevor Horn (quite understandably, I suppose) not having the self-confidence to push the band toward a more commercial/contemporary direction. With the result many of the tracks on the album wound up being over-produced (over-progged, even). The two big un’s Machine Messiah and Into The Lens would both have benefited from being around 5 minutes shorter – something Horn, I am sure, had he been sole producer would have ensured. Indeed, he did later re-record the latter as a much simpler song. The one real gem in the collection was Run Through The Light – a proper lyric, and some absolutely coruscating guitar work from Steve Howe. It was, ironically enough, the only track the band chose not to play live. The other lengthy track on the album Does It Really Happen? (complete with Downes performing his best Tony Kaye impression) was, however, used to open the show. But it was only once the band moved into Yours Is No Disgrace that the limitations of Horn’s voice became apparent – he was not a bad singer, far from it, but his natural vocal range did not reach Jon Anderson’s. He was in many ways hung out to dry by Squire on this point, by the bassist’s refusal to agree to play the older songs in a lower key to accommodate Horn. There were audible groans all around us as the high notes on And You And I and Starship Trooper were reached for and missed. The other new lad Downes had an easier time of things, and he enjoyed a solo spot midway through the evening, slipping in a vocoded verse from Video Killed the Radio Star into Man In A White Car……….to almost universal silence. Myself and a few others applauded in recognition, but mostly there were just snarls from those around me. Squire’s bass solo piece The Fish, made its first live outing since the days of the Fragile tour back in 1972. For some reason the hymn Amazing Grace made its way into the piece, but failed to save the exercise from being just so much musical-wanking. Wife-to-Be (never one to suffer fools gladly – the author excepted), made her feelings pointedly known by sitting down arms folded wearing one of her “not impressed” faces whilst all around her, us real Yes fans remained politely standing and suitably reverential. Starship Trooper closed the set, with the band returning to play Roundabout as an encore, on which Horn actually achieved a decent job. Finally all five were given an opportunity to show off their singing abilities (or lack thereof) with a brief a capella version of Man in a White Car. A few years later Anderson was back in the fold, and Horn given free reign as producer – the result being the multi-million selling 90125 album. Or at least multi-million selling in the USA, who lapped it up. Us Brits were a touch more reticent – this particular Brit unable to see what all the fuss was about, and it would be 32 years before I attended another Yes gig.